Capacity of 1 litre – that’s plenty of ice cream for everyone! You can’t buy happiness but you can buy your own ice cream maker! What could be better that treating yourself and indulging in a bowl of delicious homemade ice cream? Nothing! You can indulge and make beautifully mouth-watering ice cream from the comfort of your own home! How’s that for indulgence? This pretty in pink ice cream/ sorbet maker by Beper is easy to use and you can enjoy using it on your own or with your family. It can be a great activity to enjoy on a day off or when your children aren’t at school. Included with your delightful, electric ice-cream maker you will find a number of recipes to get you going on the road to making drool-worthy ice cream! Of course you are not limited to these recipes alone and you can be as creative as you want, trying and testing as many different ice creams as you can possibly handle. Mix the strawberries and put them through a sieve to avoid mixing in the seeds. Add the sugar and yoghurt and mix. Pour the mixture into the cooled bowl (by turning the blade). 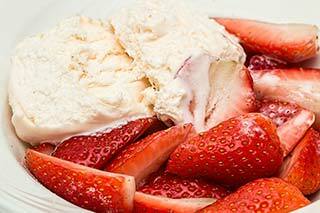 For a super fruity treat, add a handfull of fresh strawberries to your bowl of ice cream and finish with a crunchy wafer! After you have read your instructions and all your ingredients are in the ice cream maker, let the unit run for about 20-40 minutes. The maximum operating time is only an hour! No need to order dessert from a restaurant or from the supermarket any longer.